This bath set had a crummy little tag on it that I quickly snipped off as soon as I got home. 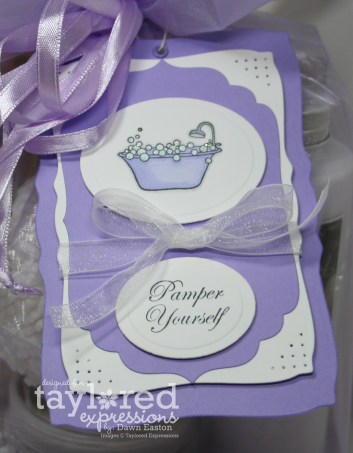 Adding a handmade tag using the Luxurious Labels makes this boring set spring to life! Ohhhhh....I love it! Feel free to send it my way =) LOL! Amazing job, Dawn. The coloring is wonderful and I love all of your nesties used. Beautiful purple yumminess Dawn!! I feel so pampered just looking at this beautiful set! now this purple is my type of spa? can i fit in the tubby?